Pope Benedict's four day Apostolic Visit to Portugal has come to an end. The trip was comprised of 13 major events, three open-air Masses and an estimated one million participants overall. The Holy Father set forth on his visit to promote the evangelization and missionary work that needs to be done on behalf of the Catholic Church. He implored the Portuguese community, which has nearly a 90% Catholic population, to live and spread the message of the Gospel, first and foremost in their own society. The importance to promote efforts to evangelize rather than allow the message of Christ to go unheard was at the heart of the Pope's message to the Portuguese. 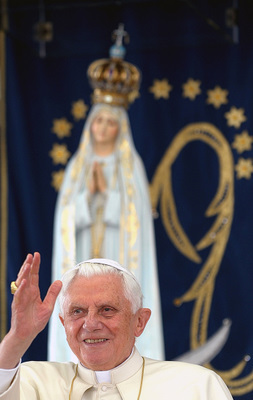 He used the occasion of the Feast of Our Lady of Fatima to highlight the continued relevance of the Apparitions of Mary still have to this day, emphasizing the message of prayer, penance, and conversion. He stressed that the faith in many places seems like a light in danger of being "snuffed out forever." He went on to say that the Church's priority is "to make God visible in the world and to open for humanity a way to God." "Don't be ashamed," he told Portuguese Catholics, "to show the signs of your faith." The farewell ceremony for the Pope was held at the International Airport of Porto. A red carpet lined the runway leading up to the podium and plane. The Pope gave his farewell speech which was then followed by a speech from the President of the Republic of Portugal. In his address, the Holy Father once again thanked the people of Portugal for their warm hospitality, noting his joy in witnessing the faith and devotion of the Portuguese ecclesiastical community. He imparted his Apostolic Blessing unto the country of Portugal and promised to pray for the peace and courage of the Portuguese population through the intercession of Our Lady of Fatima. At the conclusion of my visit, my heart is filled with vivid memories of a great many moments from my pilgrimage to Portugal. I shall long remember the heartfelt and affectionate welcome that you accorded me, the warmth and spontaneity with which bonds of communion were established with the groups that I was able to encounter, the hard work that went into the preparation and realization of the pastoral programme. After remarks from President Cavaco, Pope Benedict said goodbye to the Bishops of Portugal as well as various Portuguese dignitaries. If you missed this morning's live coverage of the Pope's final Mass and farewell ceremony, it will air once again on Salt + Light Television, Friday evening, May 14th, at 8pm ET/5pm PT. Salt + Light would like to acknowledge Father John Bertao, of the Archdiocese of Toronto, for being our guest throughout our live coverage and providing our viewers with commentary that gave us valuable insight into the Holy Father's journey. We would also like to thank Catholic News Service Rome Bureau Chief John Thavis for providing us with on-the ground reports from Portugal as he traveled with the Vatican Press Corp throughout this visit. Thank you for watching Salt + Light's coverage of Pope Benedict XVI's Apostolic Visit to Portugal. We'll see you again in less than a month when the Holy Father visits Cyprus from June 4th to 6th! Visit our website in the coming weeks for broadcast details.